Who doesn't wanna be cozy in a t-shirt? Nothing makes me more happy to be out and about than also being in comfortable clothes. This t-shirt from the Loft is my new favorite! 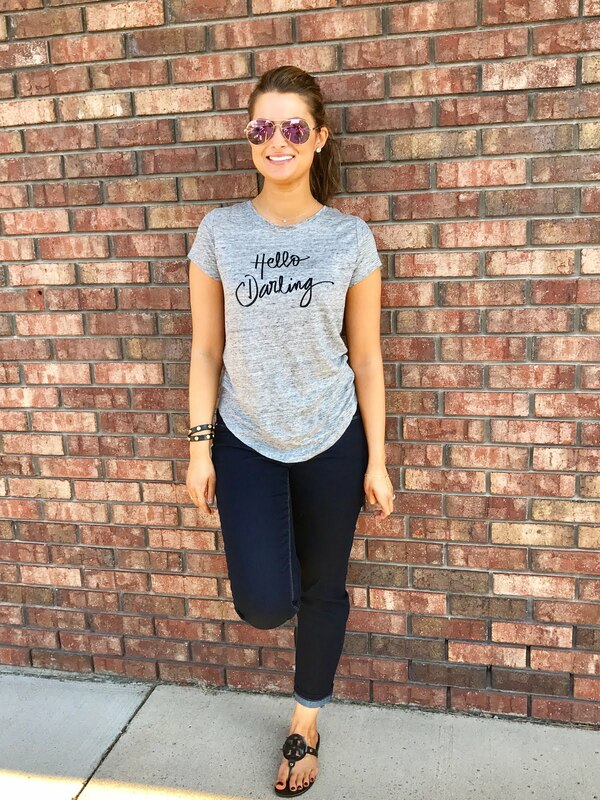 Besides the cutesy phrase of, "hello darling", its the perfect fun, and cozy shirt to pal around in. It's 100% linen, which means its super breathable for hot summer days, and the shirttail hem is adorable and adds a unique touch to a summer staple. 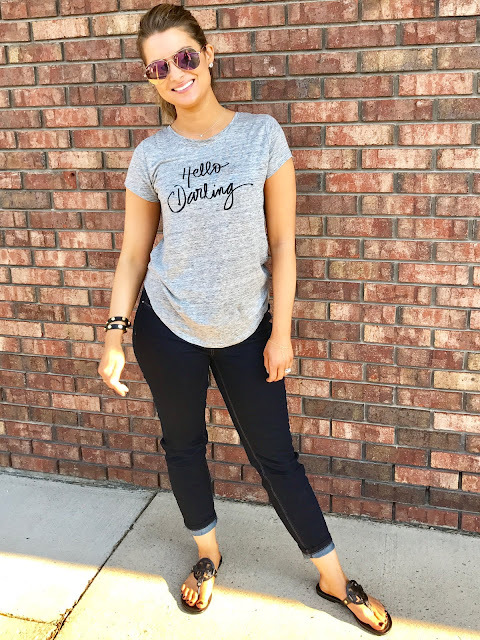 These jeggings are from White House Black Market and are the comfiest jeans I've ever had! My only tip would be to size down, they are super stretchy, which obviously helps keeps them comfy- but they stretch. I have to put these guys in the dryer after each wash- not something I usually do with jeans. My sandals are from Tory Burch and I love them! They are fashionable and comfortable, and are the perfect summer shoe for running errands. My sunglasses are from the Loft also, I picked these puppies up on sale for about $5! It was some super sale last weekend, not sure if the same sale is still going on in store- but I know online they are $14.99- still not bad! Can you believe it's officially summer?? Where is the year going? What are your plans for the weekend? She is looking very cool on tshirt. Visit T Shirt Printing Malaysia to print high quality printing tshirts and other apparels online. Thanks. You look cool in this t shirt and it also suit on you. Visit many website to buy golf apparel shirts online in reasonable price. Love those shirts and the fact that some have water on them makes the picture that much more "real", if you know what I mean. The Tshirt is awesome too! game of thrones sweatshirts.